We guarantee all students accommodation near to our beautiful campus. The accommodation facilities our students stay in are located within the Suzhou Dushu Lake Science and Education Innovation District (SEID) and managed privately by the Suzhou Industrial Park Education Development and Investment Limited Company. You will receive information about your accommodation options once you have received your unconditional offer. We will assist in booking accommodation once you have paid your deposit to secure your place at XJTLU. Where possible, we will try to allocate you to your first choices. However, due to supply and demand, we may not be able to satisfy your first choice. All international students are guaranteed accommodation throughout their study at XJTLU. Accommodation options range from studios to six-bedroom apartments (subject to availability with preference given to advanced bookings). The Parfait International Apartment mainly provides accommodation to international students from all over the world. With well-equipped facilities, considerate service, and an international living atmosphere, it also creates a good learning and living environment. There are two types of apartment available; either four- or six-bedroom, each with ensuite rooms, a shared couch area and kitchen. Bedrooms and the living room have heating. A television is provided in each apartment. Daily rent: Depending on the length of the tenancy contract, the current daily rent is between RMB 45-128. Internet: All rooms come with a cable internet connection. Tenants should buy their own router if they want a Wi-Fi connection. 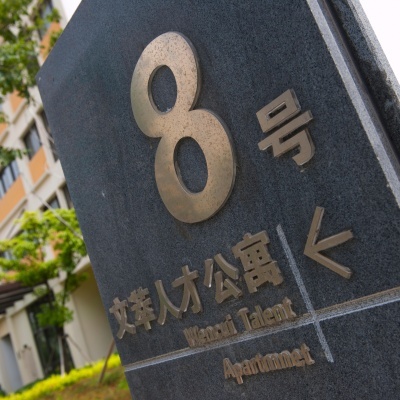 Reservation: Booking with XJTLU Global is required if students want to live in Parfait International Apartment. Located in the same area as Parfait International Apartment, Parfait Hotel and Apartment mainly provides single studio rooms to tenants who prefer more privacy. Daily rent: Depending on the length of the tenancy contract and the type of the room, the current daily rent is between RMB 66-100. Internet: Not included. Tenants have to purchase their own internet connection. Reservation: Booking with XJTLU Global is required if students want to live in Parfait Hotel and Apartment. The MBA Apartments are closest to the campus near to the lively Wenxing Plaza and are mainly three-bedroom apartments. Apartments have a shared bathroom. The shared lounge contains a water dispenser, television, refrigerator and microwave. There are no separate kitchens in these apartments. Daily rent: Depending on the contract length, and the location as well as size of the bedroom, the current daily rent range is between RMB 43-62 per room. The Scholar’s Garden Apartment provides single studio rooms with kitchen area. Daily rent: Depending on the length of the tenancy contract, the current daily rent is between RMB 82-102. Reservation: Booking with XJTLU Global is required if students want to live in Scholar’s Garden Apartment. The Wenhua Apartment located 4.5km far from campus. It provide two room types: single studio rooms and two-bed room (bunk beds). Rooms in Wenhua Apartment provide private bathroom and shared kitchen area. Daily rent: Depending on the length of the tenancy contract, the current daily rent is between RMB 50-70. Reservation: Booking with XJTLU Global is required if students want to live in Wenhua Apartment. Fee: RMB 2,200 per bed per academic year (excluding utilities and internet fees). Fee: RMB 2,750 per bed per academic year (excluding utilities and internet fees). Fee: RMB 3,850 per dorm per academic year (excluding utilities and internet fees). Accommodation options are all within walking distance of our campus meaning you can get to lectures, visit the library and spend time on campus easily and quickly. Being located in the Dushu Lake Science and Education Innovation District means we are surrounded by countless other universities and their students, meaning there are abundant affordable places to eat and regular events taking place to keep you entertained. Suzhou boasts a reasonable cost of living. Accommodation expenses (excluding utilities and internet access) vary depending on the type of accommodation you choose. It’s easy to get a taxi or bus from our accommodation to other areas of Suzhou for socialising, cultural trips or shopping.